It can experience both summer and winter rainfall. 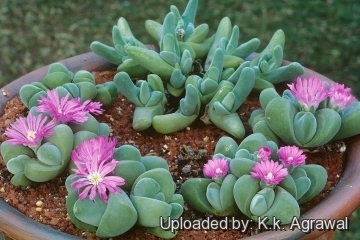 Description: Gibbaeum dispar is a dwarf, mound form extremely xeric mesembs. 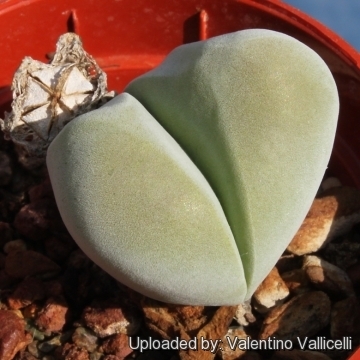 Bodies (Paired leaves): Egg-shaped, unequal in size, thick, grey-green, with a somewhat velvety texture, caused by the presence of numerous tiny hairs or papillae. There is never more than one pair fully grown at a time. New leaves round, greyish-green, from flattened outer leaves. 5) Goldblatt, P. and Manning, J.C. 2000. 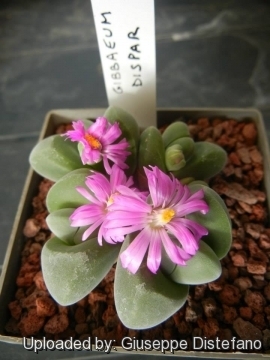 "Cape Plants: A conspectus of the Cape Flora of South Africa." Strelitzia 9. National Botanical Institute, Cape Town. 6) Hilton-Taylor, C. 1996. 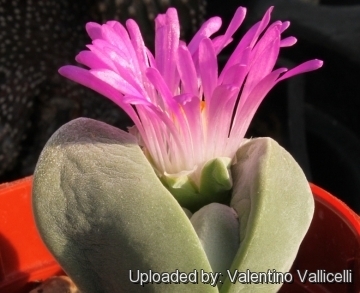 "Red data list of southern African plants." Strelitzia 4. South African National Botanical Institute, Pretoria. 7) Vlok, J. and Schutte-Vlok, A.L. 2010. 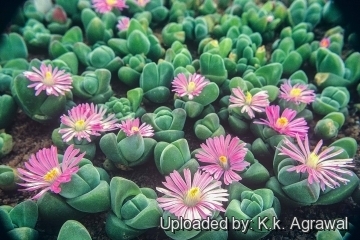 "Plants of the Klein Karoo." Umdaus Press, Hatfield. Cultivation and Propagation: It is a "winter" grower which is most active from late winter until later spring and heading for summer dormancy, and notoriously difficult to grow because it rot very easily. Soil: It grows best in sandy-gritty soil and requires good drainage as it it is prone to root rot. 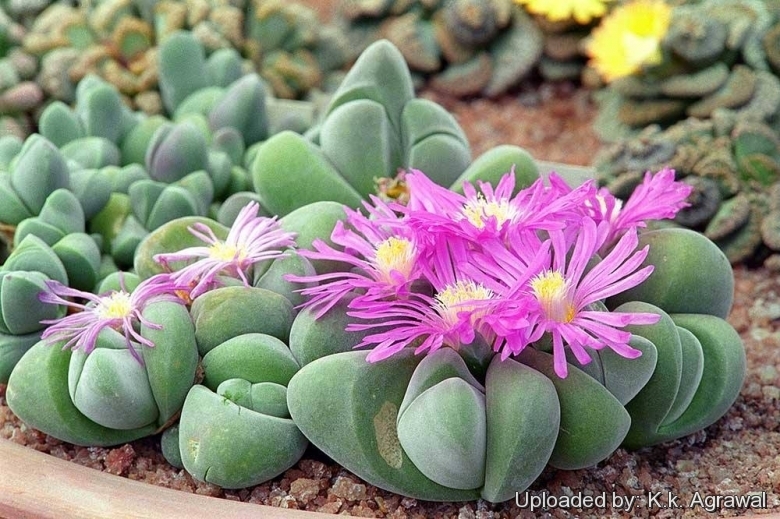 It can grows outdoor in sunny, dry, rock crevices (protection against winter wet is required) It can also be cultivated in alpine house, in poor, drained soil. 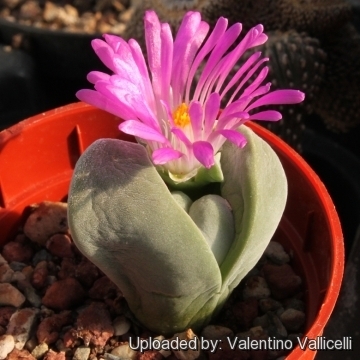 Watering: The Gibbaeums thrive in dry and desert regions and are able to stand extended periods of drought and require careful watering. Water minimally in summer, only when the plant starts shrivelling, water more abundantly when they are growing in the autumn and spring, but let the soil dry between soaking. Requires little water otherwise its epidermis breaks (resulting in unsightly scars). If grown in a container, bottom watering by immersing the container is recommended. It must have very dry atmosphere. Hardiness: It prefer a very bright situation and require a minimum temperature 5°C (But will take a light frost and is hardy down to -7° C for short periods if it is in dry soil). USDA zones 9A – 11. Propagation: Seed in autumn or (or rarely) cuttings. Take the cutting from a grown-up mother plant. Each cutting must contain one or more heads along with a fraction of root and permit to dry out a couple of days, lay it on the soil and insert the stem end partially into the soil. Try to keep the cutting somewhat upright so that the roots are able to grow downward. 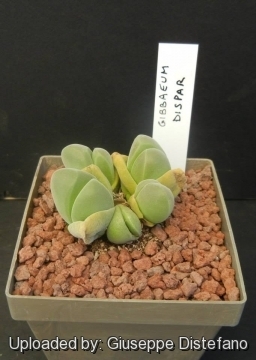 It is relatively difficult to root Gibbaeums from cuttings and generally pointless as well, so quick are they from seed.